This Norman Gothic Revival style building has one plus stories, a slate roof and is intact. It has a front gable roof with graduated slate shingles, and parapets on gable ends. There is a Greek Cross at the front peak. 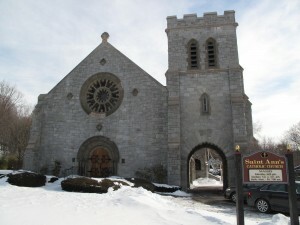 The church has fieldstone cladding, cast stone trim which is also known as “Case Cement”, a three-bay front façade with center entrance over which is a large rose window. There are four bas relief plaques depicting evangelists Mathew, Mark, Luke and John surrounding the rose window. There are arched oak double doors with elaborate decorative wrought iron strap hinges. They have Roman-arched door surrounds that are heavily carved with geometric and curvilinear designs springing from engaged columns. A crenellated square tower extends to the right of the front facade and incorporates a porte-cochere with gargoyles at corners. There are lancet windows with slate louvers at the belfry level. There are five-bay side elevations defined by buttresses with Tudor-arched stained glass windows between. There are projecting entrance bays on both the left and right sides proximate to the rear. There are lantern light fixtures in the yard. LENOX – Francis Burrall Hoffman, 98, former summer resident here who was the architect of the present St. Ann’s Church, died last Thursday at his home in Hobe Sound, Fla.
Born in New Orleans, La., March 6, 1882, he was the son of the late Mr. and Mrs. Francis Hoffman. He spent most of his life in New York City, where he was a professional architect. While a summer resident here, he designed the granite St. Ann’s Church structure that was built in 1912 to replace the former wooden church on Main Street. He was a 1903 graduate of Harvard. During World War I, he served with the 42nd Infantry Division in France. He leaves two brothers, Albert Hoffman of Florida and Murray Hoffman of New York City. A funeral mass was held Saturday at St. Christopher’s Church in Hobe Sound. Burial will be in St. Ann’s Cemetery tomorrow at 10 a.m. The Roche Funeral Home is in charge of local arrangements. Francis Burrall Hoffman (March 6, 1882 – November 27, 1980) was an American born architect best known for his work with James Deering’s Villa Vizcaya in Miami, Florida. Francis Burrall Hoffman ( March 6, 1882 in New Orleans, Louisiana – November 27, 1980 in Hobe Sound, Florida) was an American born architect best known for his work with James Deering’s Villa Vizcaya in Miami, Florida. Francis Burrall Hoffman, Jr. was born to a wealthy and socially prominent New York family line that began with the emigration of Martin Hermanzen Hoffman from Sweden in 1657. The family remained closely tied to the history and politics of the state, with Hoffman’s great-grandfather, Murray Hoffman serving as a Justice of the Supreme Court of New York and his grandfather, Wickham Hoffman acting as the United States Minister to Denmark from 1883-93. Hoffman attended Harvard University, graduating in 1903. Hoffman spent his senior year as an apprentice at Carrere & Hastings, an architectural firm in New York. From 1903 to 1907, Hoffman attended the École des Beaux-Arts in Paris, graduated with honors and returned to Carrere & Hastings in 1907. In 1910, Hoffman left Carrere & Hastings to begin his own architectural firm in Manhattan. He shared an office space, as well as collaborating on projects with Henry Creighton Ingalls. Hoffman’s first commission was a mausoleum in the Woodlawn Cemetery for Edmund Walstein Davis. In 1912, Hoffman was hired by James Deering as an associate architect for Villa Vizcaya. Collaborating with Paul Chalfin and Diego Suarez, the bayfront Italian style villa would become the largest and most notable project of his sixty year career. Hoffman left the Villa Vizcaya project five years later in 1917 to enlist in the Army. During WWI, Hoffman served as Captain with the Corps of Engineers and later directed camouflage operations with the Second Corps, A.E.F. During WWII, Hoffman served overseas as a Lieutenant Commander in the Navy . In 1927, Hoffman married Virginia “Dolly” Kimball. Kimball was from a wealthy Virginia publishing family and quickly established a career as an interior decorator, and was often enlisted in the design of her husband’s projects. After the stock market crash in 1929, Hoffman closed up his firm in New York and he and Dolly spent a majority of their time traveling between New York and Paris. Upon his returns to New York, Hoffman rarely engaged in more than one architectural project a year . Hoffman completed many commissions, mostly designing large houses for wealthy clients. Hoffman’s last project was completed in 1974, when he was nearly ninety-eight years old . Hoffman died in 1980 in Hobe Sound, Florida. Lenox was organized as a mission of the Roman Catholic Church in 1852. 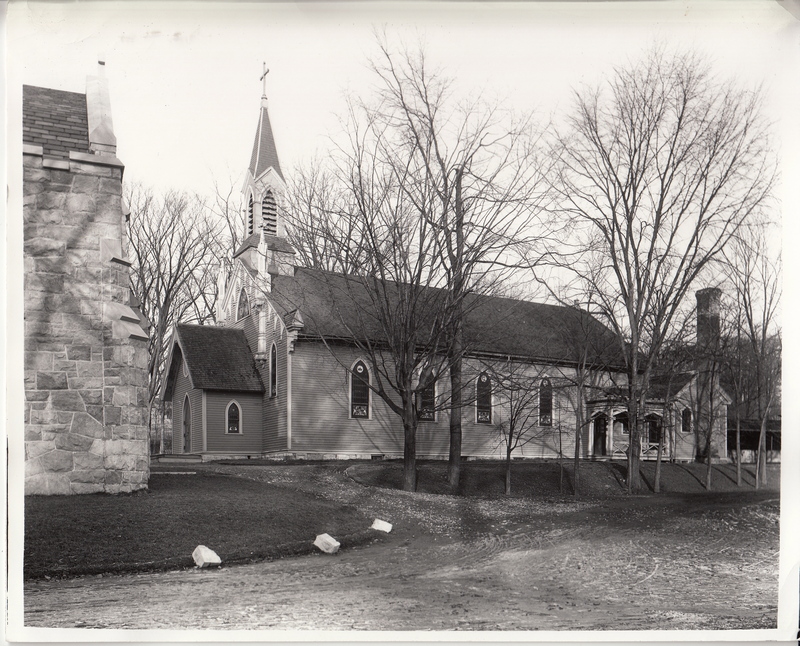 Mass was said in Town Hall until 1871, when Father Brennan led his parish to build the first St. Ann’s Church. 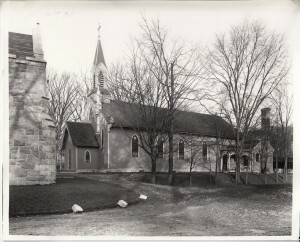 The parish included some influential members of Lenox society; Rose Hawthorne (daughter of Nathaniel Hawthorne), who was born in Lenox in 1851 and was a convert to Catholicism, Grace Sedgwick, a member of the locally prominent Sedgwick family, and Mrs. Samuel Ward, both converts to Catholicism. Mrs. Ward’s husband built a chapel for her at his estate, Oakwood, and Mass was often said at that location.